We offer many types and configurations of hovercraft for sale. However before you buy a hovercraft, it is worth considering the operating cost which is determined by the type of hull material used in construction, and the power of the engine. Many hovercraft are constructed from thin glass fibre, but while this material looks great, it can easily break. Hovercraft fly over land and any collision could create hairline cracks that allow water to ingress into the hull. 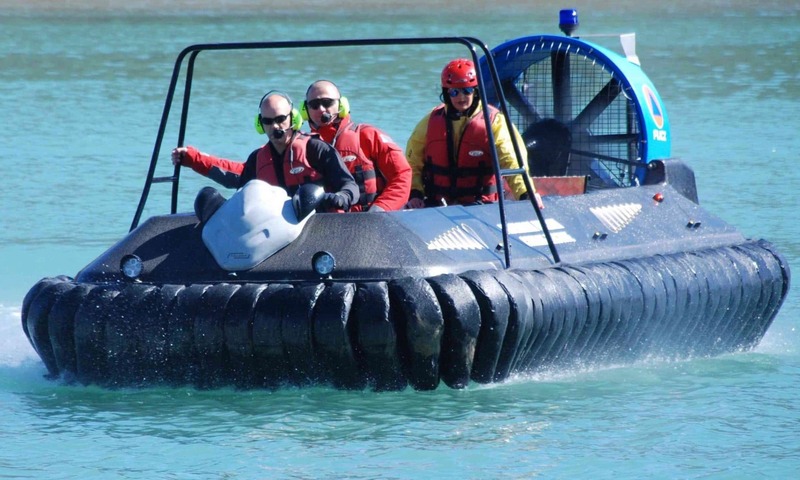 Commercial hovercraft can be constructed from expensive aluminium or Carbon Fibre with Kevlar. When hovercraft commence operations, their power source determines how much lift or payload they can handle. Starting when on-water takes more power requirement since all hovercraft create a pressure wave commonly referred to as The Hump. It is important to ask hovercraft suppliers for on-land payload capability and on-water payload capability – hovercraft usually handle 50% more when starting on-land – so always check on-water payload. Note also that it is easier to start in deeper water than in the shallows (less than 6 feet depth). To get over Hump, may require pilot and passengers to shift their weight forward when starting on water. Cheaper hovercraft tend to have cheaper under-powered engines, that have low power payload capability for on-water starting. Suppliers might say – well start on land then, but that is not always possible – failure to get back on the air cushion will probably require an emergency call-out to get you home, so this is an important consideration. Safety can also be compromised – cheaper hovercraft tend not to have many safety features or strength in other critical areas. To determine the value of a hovercraft, simply divide the cost of the hovercraft by the number of pounds or kilos of on-water start payload to determine the cost per $ or € per unit of lift. Consider your own weight, the weight of your fuel, and the weight of your passengers and optional extras. Your budget may determine that you pick the cheapest product available, cheap shoes leak water, cheap hovercraft lack lift when starting on water, your choice but if you are seeking the best value hovercraft, consider the strength and low weight properties of Carbon Fibre with Kevlar Also consider safety, and the need to get home.